Saudi Arabia’s royal court said the kingdom’s second in line to the throne will meet President Donald Trump at the White House this week. It will be the pair’s first meeting since Trump took office in January. Saudi Deputy Crown Prince Mohammed bin Salman – the kingdom’s defense minister and also responsible for its reforms – will meet with Trump and a number of US officials to discuss “the strengthening of bilateral relations between the two countries and regional issues of mutual interest,” a royal court statement read, announcing the prince’s departure for the US on Monday, according to AP. There were no details given on when he would meet Trump. Saudi Arabia, the world’s top oil exporter and the biggest buyer of American-made arms, is also part of the US-led coalition’s bombing campaign against Islamic State (IS, formerly ISIS/ISIL) in Syria. Key issues on the agenda with Trump are likely to include discussions on global energy prices, as well as the conflicts in Syria, Iraq, Libya and Yemen, where a Saudi-led coalition with Washington backing has been bombing Iran-backed Shiite rebels for nearly two years. The Russian Foreign Ministry spoke out on Monday about a Saudi-led coalition plan to launch an assault on Yemen’s biggest port-city, Al Hudaydah, warning such an operation could significantly worsen the humanitarian situation in the war-torn country. Saudi relations with Washington cooled under President Obama after his administration secured a nuclear deal with regional rival Iran. The deal has been heavily criticized by Trump. During his presidential campaign, Trump repeatedly accused Democratic candidate Hillary Clinton of being the recipient of Saudi money. "Crooked Hillary says we must call on Saudi Arabia and other countries to stop funding hate," Trump wrote on June 13, 2016. "I am calling on her to immediately return the $25 million plus she got from them for the Clinton Foundation!" Analysis by PolitiFact however found Saudi Arabia contributed several times to the Clinton Foundation, and in 2014 is alleged to have given under $10 million. Whether that generosity will have any effect on the direction of talks at the White House this week remains to be seen. The kingdom has expressed optimism about rebuilding its alliance with Washington and working with the Trump administration to contain Iran’s reach in the region. 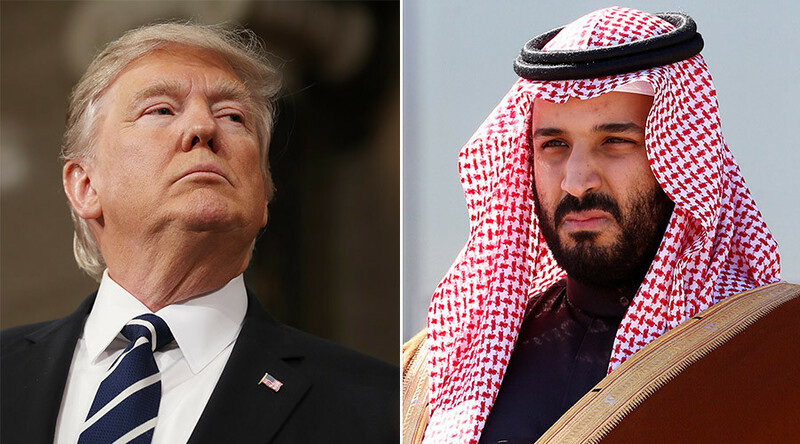 In a call between Trump and King Salman bin Abdulaziz al-Saud in January, the two agreed to back safe zones in Syria and Yemen, according to a White House statement. Prince bin Salman is in charge of the kingdom’s efforts to revive state finances by diversifying away from reduced crude oil revenues. Under the plan, which seeks to promote the private sector and make state-owned companies more efficient, Riyadh aims to sell up to 5 percent of state oil giant Aramco in what is expected to be the world’s biggest initial public offering. The country, an absolute monarchy and follower of Wahhabism, underwent an austerity drive last year to reduce state spending after a surging budget deficit due to slumping oil prices. “By freeing the kingdom from the statist model of its past, bin Salman hopes ultimately to create new private sector jobs for younger people in a country where half the population of 21 million Saudis – there are also 10 million expatriates – are estimated to be under 25,”according to Reuters. “Younger Saudis face entrenched unemployment, a skills shortage, a lack of housing and growing pressure on living standards as the kingdom's oil income grows ever less able to finance the needs of a rising population,” the news agency stated.